Hundreds of websites, Instagram accounts and Facebook pages are openly buying or selling lions, turtles, snakes, scorpions and other animals. Chaudhry Usama Wains received a message on his Facebook page in January 2018. An aspirant for a Khyber Pakhtunkhwa assembly seat was interested in buying a lion and wanted it delivered to a specific location in Peshawar. Wains, who deals in animals, drove from his home in Faisalabad along with an African lion and a couple of companions a few days later. As they were about to reach the designated spot, two cars approached. Some men got out of them and took away the lion forcibly — without paying a penny for it. Wains does not know who the lion-snatchers were, but he suspects that they were sent by the politician. Politics and lions have a close association in Pakistan. Politicians who make a name for themselves often come to be known as the lions – undisputed rulers – of their respective constituencies or districts. A few of them have gone on to earn the title of Sher-e-Punjab — the lion of Punjab province – the most famous of them being a former CM and provincial governor, Malik Ghulam Mustafa Khar. For some inexplicable reason, however, a lion is not included in the list of election symbols approved by the Election Commission of Pakistan. Nawaz Sharif’s party, Pakistan Muslim League-Nawaz (PML-N), has, therefore, settled for the next best thing – a tiger – as its election symbol. By a stroke of linguistic luck, they are still able to call their symbol a sher — a word locally used for both lions and tigers. Love for shers runs high in the PML-N’s echelons. In 2009, Nawaz Sharif’s nephew Salman Shahbaz obtained a special permit from the federal government to import two Siberian tigers from Canada. His father, Shehbaz Sharif, was Punjab’s chief minister at the time. The issuing of the permit created a big stir in the news media. Siberian tigers – scientifically called panthera tigris altaica – face a threat of going extinct and the Convention on International Trade in Endangered Species of Wild Fauna and Flora (CITES), a global covenant which Pakistan is a signatory to, prohibits their trade. The media coverage of the whole affair and the criticism it generated forced Salman Shahbaz to hand over a male tiger he had imported before the news broke to Punjab’s wildlife department which has kept it at the Murree Wildlife Park in Bansra Gali since then. Park officials disclose that the tiger has become weak. It is also living a solitary life since its intended partner was never brought to Pakistan. Some other shers – caged or chained – have been spotted at PML-N’s election gatherings and protest rallies. Many of the party’s candidates in past elections have also paraded lions during their campaigns to mobilise support. More often than not, these animals have been sold and purchased by skirting around, if not entirely flouting, rules and regulations. Wains first saw a lion up-close at the house of a friend in Lahore about two and a half years ago. The animal scared him. “I had kept dogs as pets but there is a huge difference between a dog and a lion,” he says. In subsequent visits to his friend’s place, he gradually started feeling comfortable around the lion. By December 2016, he fell so much in love with the animal that he decided to buy one for himself. He obtained an import permit and contacted a trader in South Africa who promised to send him a lion for 300,000 rupees (inclusive of delivery charges). Wains paid him around 200,000 rupees in advance – around 65 per cent of the total – as was agreed between the two. After receiving the advance money, the trader stopped taking his calls and disappeared. In March 2017, Wains made another attempt. The deal went through successfully this time round and he received his first African lion around a month later. It was not a wild animal, according to Wains, but was bred at a farm. Soon, he started thinking of setting up his own lion breeding farm. 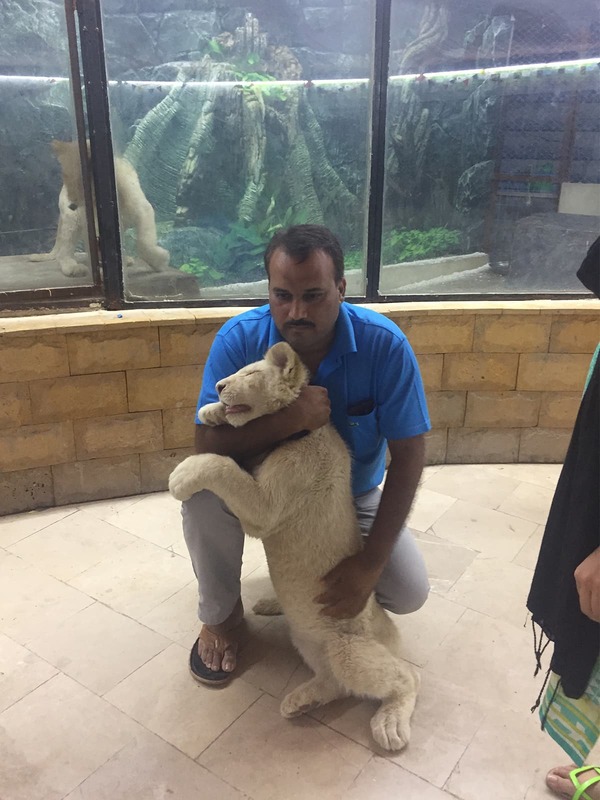 He spent some time learning animal farming from two other wildlife breeders – one based in his own hometown, Faisalabad, and the other operating in Karachi – who breed a variety of animals such as deer and ostrich. He then imported eight more lions and set up two farms — one in Islamabad and another in Muzaffargarh. The second one is still under construction, he says. Wains started his lion breeding business while he was still a student. His family often reprimanded him for indulging in it, especially when he would bring some lions home. “My brothers have small children. They were terrified to let their children be close to the lions,” he says. Overtime, though, they all became supportive of his venture. Wains has three personal profiles on Facebook. In one of them, he calls himself a zoo owner; another describes him as the CEO in Wild Pets Club; the third has a picture of a man in his early twenties. “I am [a] Wild Animals Exporter. I have all wild animals for sale. I have three offices in South Africa, Mexico and Pakistan,” reads his personal description in one of the profiles. Wains now has several animals at his farms, including a snake, two deer – each four months old – several parrots and many big cats: a 10-month-old pair of white lions, an 11-month-old female white lion, a 10-month-old wild lion and a farm-bred one of the same age. He sells the African lions he breeds for a minimum price of 550,000 rupees (inclusive of delivery charges). Stung by what happened to him in Peshawar, he has started collecting 50 per cent of the price before making a delivery. In August 2018, an Indian named Karthik used a Facebook forum to accuse Wains of scamming him. Karthik’s post alleged that Wains had promised to send him a lion in India via a train from Pakistan for 3,000 US dollars that were to be deposited in a bank account in Malaysia. After Karthik transferred the money in two instalments, he alleged, Wains stopped responding to his calls. Wains denies the allegations. He says he does not export lions. “It is difficult to have them cleared from the customs to take them out of the country,” he says. “You need to pay a lot of money and also procure a CITES permit from the government.” It “is a hassle” he prefers avoiding. On a recent Sunday evening, Hamza Hussain climbs a flight of stairs along with two young men to enter a roofless enclosure at the top of his 350 square yard house in Karachi’s PECHS area. A three-year-old brown African messai lion is lounging in the enclosure, tied to a concrete pillar with a chain and holding a meaty bone in its mouth. It stares vacantly at Hussain and his companions. The two men want to photograph themselves with the lion. They take turns to pose just behind it. The lion looks unperturbed. It seems accustomed to people moving around it. Hussain, who is in his mid-twenties and works as a freelance videographer and restaurateur in Karachi, purchased the animal from a dealer in Lahore when it was a small cub. He named it Simba and initially housed it in a small room – on the floor right below the enclosure – which has enough space to accommodate just a single bed and a cupboard. Simba was born in Lahore with deformed legs (probably due to the deficiency of Vitamin D) but his deformity has been cured now. “It was very social when it first came into my house. It would sleep with me in my bed,” says Hussain. As Simba grew up, Hussain arranged a bigger space for it. He built a 2,000 square yard facility to house it near a village in Thatta district — just outside Karachi. The lion got 1,000 square yards of space to just move about — almost double of what it needs according to WWF-Pakistan’s guidelines. Hussain now brings it home only on weekends. He also keeps some other animals, including 35 pythons, at his Thatta facility. The smallest python is five feet long. He initially purchased 100 of them from Jay Brewer Prehistoric Pets, a company in the United States – having contacted the seller through its website – but some of them died and some others he sold. These days, Hussain is looking for a female companion for Simba. “If I cannot find one locally, I will import it from South Africa,” he says. Finding the animal locally should not be hard. Multiple Facebook groups offer African lions, scientifically known as Leo Panthera, for sale. Three cubs, each four months old, are available for 750,000 on one group’s page. Another group offers two brown East African cubs of messaivariety for 450,000 rupees (available for delivery at any location in Pakistan with an additional charge of 15,000 rupees). 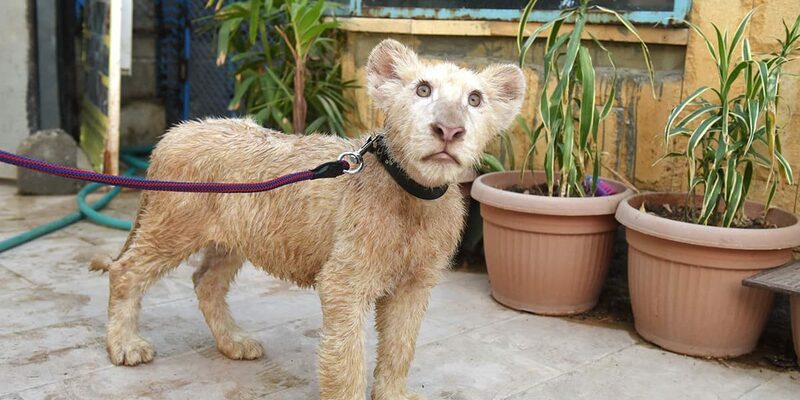 The video of a four-month-old white cub lounging on a chair in the lawn of a private property in Karachi also made rounds on social media in September this year. It was available for sale at 750,000 rupees. Some traders are peddling – both online and offline – body parts of lions as well. Lion fat is available for use in medicine meant to relieve muscular and joint pains. A Lahore-based trading website, Bolee, has a lion claw for sale for 35,000 rupees. Another online trader displays lion nails enclosed in a silver frame and attached to a metal chain. Price: 8,000 rupees. The trader claims to have imported the nails from Kenya. Lion hides are also being sold and purchased, reveals a report by the World Wildlife Fund (WWF) titled An Assessment of the Scale of Illegal Wildlife Trade in Pakistan. In 2016, the report states, the wholesale price of an African lion’s hide was 70,000 rupees and Sindh and Khyber Pakhtunkhwa provinces were its top markets. These days, lions are being sighted in many neighbourhoods across Karachi. Veterinarian Isma Gheewala confirms that lion visits to her clinic in Defence area have become quite frequent. One of them is brought to her for declawing after every month and a half. Still, Summaiya Zaidi, a Karachi-based lawyer, could not believe her eyes when she saw a young lion inside a house in Defence. She was returning home from a cinema around midnight in May this year. As her car stopped at an intersection, she saw a cub through a half-open gate. “At first I thought it was a cat but then I quickly realised that it was too big to be a cat,” she says in an email interview. An intrigued Zaidi then started gathering more information with the objective to move a court against the practice of keeping lions inside homes. 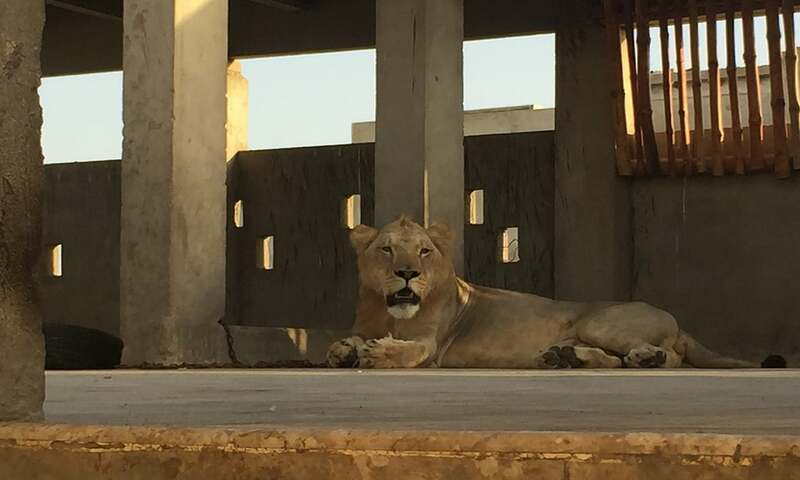 Along with another lawyer, Muhammad Ali Lakhani, she subsequently filed a petition at the Sindh High Court, seeking punishment for those who were keeping lions in captivity. The petitioners also asked the court to cancel all previously issued permits for the import, trade and possession of big cats. There is nothing much that the court could do. The problem is that there is no law in Pakistan to prohibit the possession of a wild imported animal, says Uzma Khan, who works as a technical advisor for WWF-Pakistan. If, for instance, someone is keeping a lion as a pet inside their house and their neighbours do not like it, all they can do is go to the police and register a complaint under section 289 of the Pakistan Penal Code that pertains to “negligent conduct with respect to [an] animal”. Zaidi and her co-petitioners wanted a lot more. They requested the court to order the federal government to set up a ‘scientific authority’ to determine whether or not importing lions was detrimental to the survival of their species. They also wanted clear court orders that those keeping lions as pets provide the animals enough space and other facilities they require to live in peace and comfort. After a hearing this August, the court finally ruled that no permit/licence must be issued without fulfilling the requirements mentioned in the Pakistan Trade Control of Wild Fauna and Flora Act 2012. This is exactly what Pakistani laws already require — at least on paper. A few years ago, Dr Farooq Sattar, a senior leader of the Muttahida Qaumi Movement, met four young men, all friends, at some exhibition in Karachi. They were holding snakes that they owned as pets. An animal enthusiast, Sattar asked them if they had more animals and how and where they were keeping them. The young men had many other animals and they were keeping them inside their own homes. Sattar made them an offer: he will arrange a public space as a habitat for their animals but they have to make them available for people’s viewing. The young men agreed. The deal looked beneficial to them: their animals would get a large place to inhabit as compared to the cramped spaces inside their homes. Letting others share the joy of seeing the animals was a small price to pay. More importantly, their partnership with the government would help them in getting import permits and possession licences. 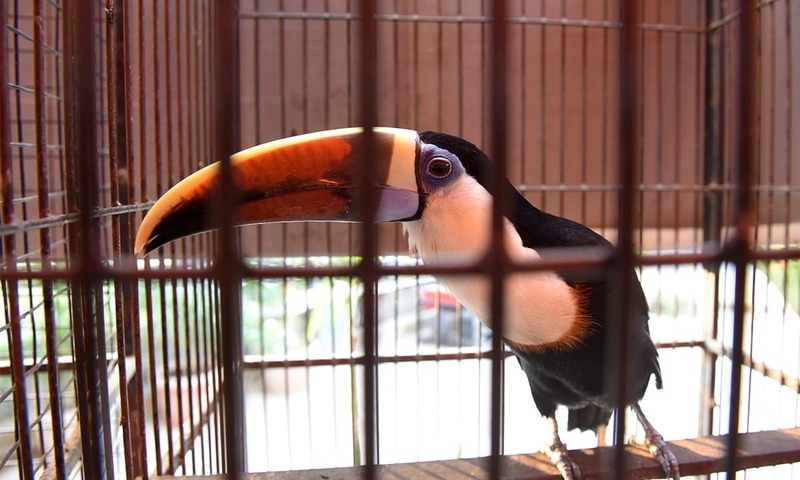 This is how a public park in Karachi’s Nazimabad locality came to house the Wildlife Experience Center that has many local and foreign animals — a couple of crocodiles, a vulture, a toucan, flamingos, parrots, monkeys, an owl and a falcon among others. Its biggest attraction is two white lion cubs — a male and a female. On a recent evening, they can be seen roaming around in a large enclosure at the park, separated from the viewers by a glass wall. School children can be seen visiting the park on any day. Every now and then, various activities are also arranged there around the animals. The 50th birthday of the zoo’s resident tortoise was celebrated in August this year. Every other day as night approaches and all the visitors leave, the four friends visit the park. After they get inside, the main gate is closed and a side door in the glass wall is opened. The cubs jump out eagerly, running about and cuddling with their owners. Atif Imtiaz, one of the owners of the animals, has a video that shows the cubs playing with a football. They are jumping high in the air, trying to catch the ball. In their playfulness, they look like any domesticated pet. The cubs belong to a rare breed – falling under Appendix II of the CITES – only found in the Timbavati Nature Reserve in South Africa. They have been imported under a permit issued by the federal ministry of climate change. The process to obtain a permit is long and runs through many tiers of the government machinery. Those interested in importing animals first have to apply to get a No-Objection Certificate from the wildlife department of their province. The official cost of a certificate is 150,000 rupees but importers allege they often end up paying around 200,000 rupees in order to expedite the process of its issuance. 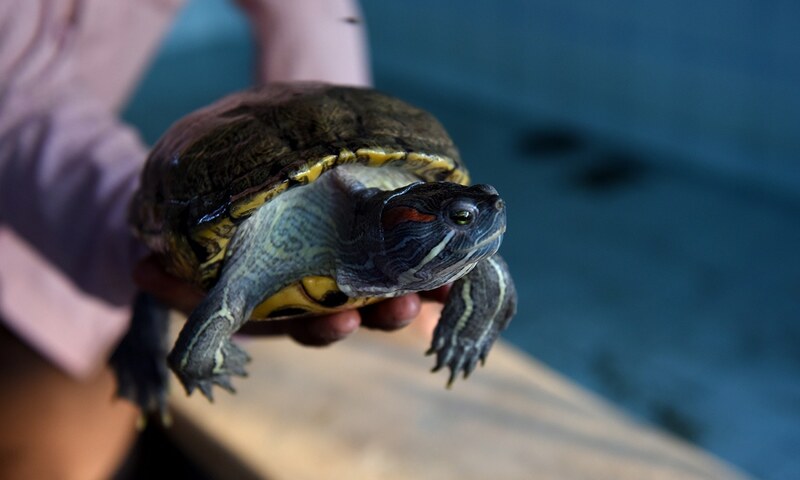 Provincial wildlife departments carry out their own checks to ensure that the intending importers have sufficient and suitable facilities to keep the imported animals and that they are registered with the provincial government concerned as non-commercial entities. 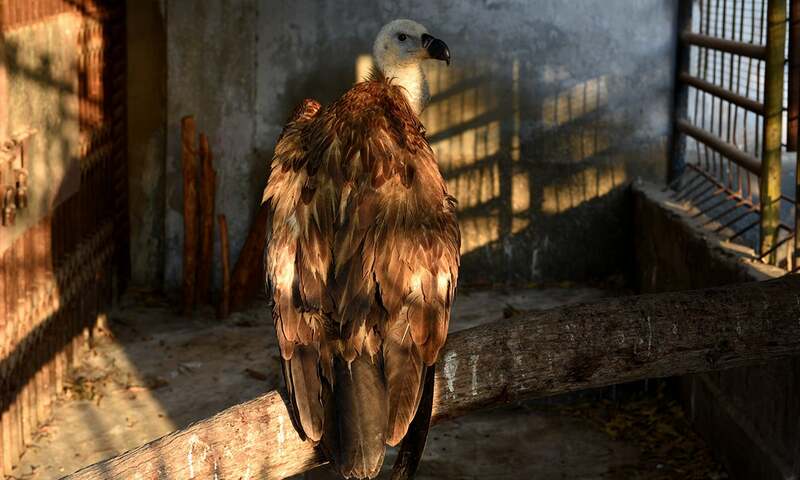 “The provinces are required to get an affidavit from the importers that the animals being imported will not be used for commercial purposes or even for breeding,” says Samar Khan, a wildlife conservator at the federal ministry of climate change. After a No-Objection Certificate is issued, importers approach the ministry of climate change in Islamabad which, after having received all the required fees and other documents, including a CITES permit from the country from which the animals will be imported, issues an import permit. Each permit is valid for no more than six months. Importers place their orders to buy the animals in advance so that their permits do not expire before their consignments arrive. Once the imported animals land in Pakistan, a doctor, designated by the provincial wildlife department, checks them and issues a certificate on the state of their health. In normal circumstances, it takes an hour for an imported animal to get out of a seaport or an airport. “Once you bring the animals in the country,” asks Hameria Aisha, a wildlife manager at WWF-Pakistan, “is there a check and balance on their sale here?” There is none. The closest thing to a regulatory regime is a set of guidelines issued in 2011 by the National Council For Conservation of Wildlife — now merged into the federal ministry of climate change. These guidelines for the acquisition and management of big cats state that trade of these animals should only be done by registered zoos and breeding farms and not by any individuals. These guidelines, however, have no legal value, says Uzma Khan of WWF-Pakistan. These are merely recommendations. “We tried to push them into legislation,” she says, by filing a petition at the Lahore High Court in May 2013 through actor-writer-activist Feryal Ali Gauhar. Justice Mansoor Ali Shah, an environment-conscious judge, was chief justice of the Lahore High Court at the time. Around 14 months after the petition was filed, he set up a commission to look into the import and possession of big cats and to devise a code of conduct for their public display during political events. In 2016, the commission recommended that the 2011 guidelines be incorporated in wildlife laws. Wildlife is a provincial subject in Pakistan. Only provincial governments have the power to enforce laws related to the poaching and trade of wild animals and punish those found in violation of those laws. Each province has different kinds of wildlife facing different kinds of threats. It makes sense, in theory, that provincial laws are tailored accordingly. In practice, this results in a situation where there is no uniform country-wide policy to deal with wildlife-related issues. While a federal law, as mentioned earlier, prohibits the possession and breeding of wild animals for any purpose other than research, education and conservation, each of the four provinces have allowed private zoos and breeding farms that may or may not have anything to do with any of the three purposes. On top of all this, foreign trade being a federal subject requires compliance with federal laws. As far as wild animals are concerned, their trade is governed by the Pakistan Trade Control of Wild Fauna and Flora Act. This law was passed in 2012 after Salman Shahbaz managed to obtain an apparently unlawful approval to import an animal listed on Appendix I of the CITES. The law specifies that any animal can be imported to Pakistan as long as they are not listed on Appendix I of the CITES. It also states that importers must provide a physical environment for the animals that is similar to their natural habitat. These provisions exist in breach rather than in compliance as do the federal government’s guidelines on the inter-provincial transport and trade of wild animals. One of the major reasons for the law not being implemented is that its implementation falls in the domain of provincial governments which often do not like federal interference in their domain. Provincial governments also do not have the resources required for law enforcement. Sometimes, their officials do not have the will and the capacity for enforcement and at other times they are simply complicit with those involved in illegal trade. “People often bypass provincial authorities,” is how Samar Khan of the climate change ministry describes the situation. He does not agree to the suggestion that the federal government should place a blanket ban on animal trade, especially of lions, both within the country and with other countries, as long as enforcement mechanisms remain ineffective. How will proper enforcement be ensured given the federal-provincial dichotomy, and the incompetence and corruption among officials responsible for compliance on the ground? He does not offer an answer. Uzma Khan of the WWF-Pakistan agrees to the extent that wildlife departments suffer from a lack of resources, but she also believes that tracking down and blocking Internet Protocol (IP) addresses involved in animal trade is not impossible. “If wildlife departments do not have the motivation or the capacity to curb online trade, the government should involve the federal information technology and telecommunication ministry in the process,” she suggests. Even if his ministry gets the mandate to do so, it will be difficult to prevent such trade in a globalised online world. Traders can easily operate websites and social media pages from territories outside the jurisdiction of Pakistani authorities. Without a concerted global effort, piecemeal, country-specific actions are never going to work. Some recent developments suggest that global level efforts are being made in this regard. In 2017, eBay, an online marketplace, announced that it had removed about 45,000 wildlife trading listings from its website. Similarly, International Fund for Animal Welfare (IFAW), a non-profit working for animal conservation globally, launched this October what it calls a global wildlife cybercrime action plan. The plan urges countries like Pakistan – where wildlife trade is rampant – to prioritise the detection and prevention of wildlife-related crimes both online and offline. It also suggests embedding cyber investigations into a government’s operations in the field of wildlife conservation. This article was republished from Herald. Read the original article here.